Good evening! I'm a bit late posting today, but better late than never, right! I made this card for today's sketch Splitcoast challenge. I kept the sketch almost the same, but I had to make my image layer a bit wider and once my card was finished I realized that I missed a layer, but I decided to upload my card anyway. I colored my stamp using my SU markers and then I stamped the image onto my card stock. 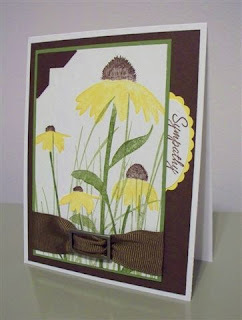 Next I inked up the grass image and then stamped that on a scrap piece of paper and then stamp it over my flower image. I wanted the color of the grass to be slightly lighter than the green leaves and stems. I actually stamped my flower image twice because I made a mistake the first time and I decided to cut out one of the (not messed up) flowers and use that on my card as well. So if it looks like there's an extra flower on my card, there is (this stamp only has three flowers, not four). My sentiment is stamped and punched using the large oval punch and layered onto Summer Sun card stock which I punched with my scalloped oval punch and I have it tucked under my Old Olive green layer, so it looks like half of an oval. I decided that the upper left hand corner still needed a little something and I decided to use a photo corner (I forgot about that punch). For my ribbon treatment, I found a buckle from my SU Hodge Podge hardware kit and I threaded my ribbon through and then I tucked my ribbon behind my Old Olive layer. I LOVE this card! I sooo want to get this stamp set. Thanks for the inspiration!